Let's be honest: this recipe is really about the aioli. Yes, some would (and do) call this mayonnaise, but when you're dipping pretzels in it (a common practice by my Grandmother that was passed down to me), calling it "aioli" seems to make it much more socially acceptable. Before I was even an official member of 37 cooks, Julie told me about the oil that she received for this challenge, which was the Jalapeño. I immediately thought if I had that oil, I would make an aioli with it. So even after I realized I had my choice of several amazing flavors, my mind was made up. Now I just needed a vehicle with which to eat said aioli. Anyone who has ever grown zucchini knows that you always have too much. I don't care how much you love it, there is always too much zucchini- which isn't necessarily a bad thing. 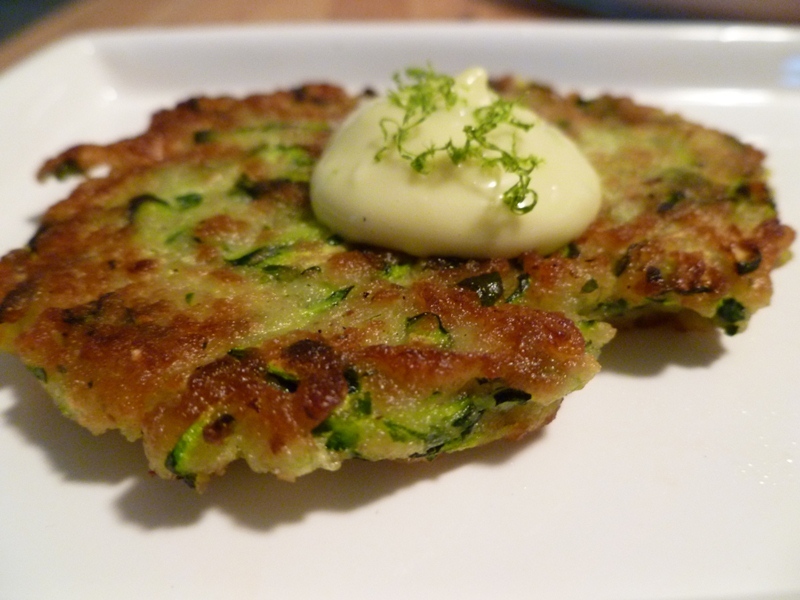 Having been faced with this dilemma many times in the past, I thought that crispy zucchini fritters would be a great companion to the creamy, spicy aioli. So the next time a neighbor or coworker tries to pawn off some extra zucchini on you, give this recipe a try. You won't be disappointed. Place egg yolk, garlic, and lime juice in the bowl of a food processor. Process until combined, about 20 seconds. With blade running, slowly drizzle in oils until mixture becomes "mayonnaise-like". Keep refrigerated until ready to serve. Place grated zucchini in a clean kitchen towel. Squeeze out as much moisture as you can, then place zucchini in a bowl. Stir in remaining ingredients. Heat a thin layer of grapeseed oil in a skillet over medium high heat. Drop 1/4 cup portions into hot oil and cook about 3 minutes per side or until golden brown. Serve with aioli.